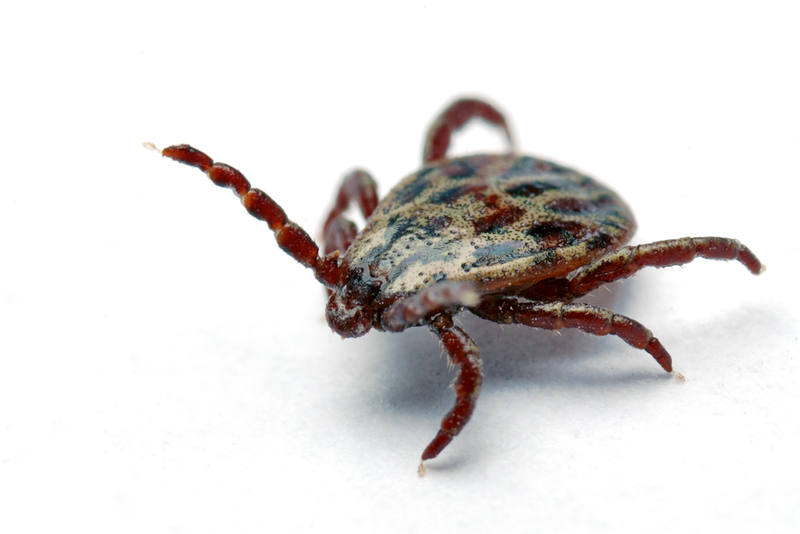 When ticks feed, they take up whole blood, extract the water (about 70–75% volume) and inject the water back into the host. For this reason, they are efficient vectors of a variety of disease-causing organisms such as bacteria, spirochetes, rickettsia, protozoa, viruses, nematodes, and toxins. A single tick bite can transmit multiple pathogens as well as creating secondary infections and allergic reactions. Ticks are the most common transmitters of vector-borne disease in the U.S.
During their lifecycle, ticks frequently drop off the host then climb up walls and vegetation and reattach themselves to a passing host. Larvae can survive as long as eight months and adults as long as 18 months without feeding. Regularly inspect pets for ticks. Remove any ticks from your pet with forceps or eyebrow tweezers. Apply gentle pressure slowly to allow the tick to loosen its mouthparts. Do not use an irritant such as alcohol or nail varnish. Afterwards wash with soap and water and apply a dry dressing over the wound. Frequently mow your grass short. Remove leaf litter, brush and woodpiles around houses and at the edges of yards. Clearing trees and brush to admit more sunlight into the yard reduces the amount of suitable habitat for deer, rodents, and ticks. When hiking, avoid tall grass and shrubs, wear white or light-colored clothing (makes hitchhiking ticks are more visible) and tuck pant legs into socks. Occasionally some repellent lotions can also be used. If you have questions or need help, please contact ClearDefense Pest Control HERE. We want to help!